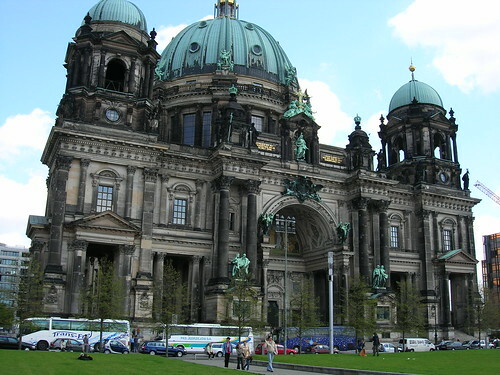 I was very interested in going to Berlin. I really couldn't wait to see it. I had a weekend without travel plans or travel partners, so off I went! It was a great adventure. 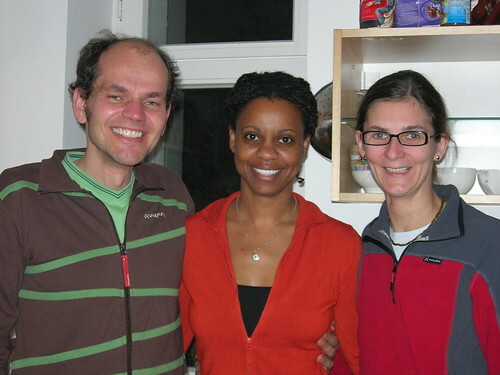 I belong to a group called Servas, an international network of hosts and travelers. Hosts, such Uwe and Grit here, offer accommodation in their homes to travelers, like me, for a short stay. It really is a great way to visit a new city. I liked getting to know a couple of real people who actually live in the city--someone besides hoteliers and waiters, that is. I got the chance to spend some time with them, visit their favorite cafe, go to the local outdoor market (a custom of theirs), and learn quite a few things about their lives. I was introduced to Sudoku puzzles, kefir (hope I spelled that right), and some good ideas for cooking and eating. They were largely vegetarians who made their own whole wheat bread--I had never seen some of the gadgets they had for handling whole grains. Fascinating. Lars is another Servas host whom I contacted when I decided to go to Berlin, and he invited me to come to a birthday party he was giving for his girlfriend, Christine. I met some of their friends and family, and it was quite exciting to be doing such things in a city I had only entered the day before. Lars is a great guy, easy to talk to, and very knowledgeable. He had a great deal of information and insight about Berlin. 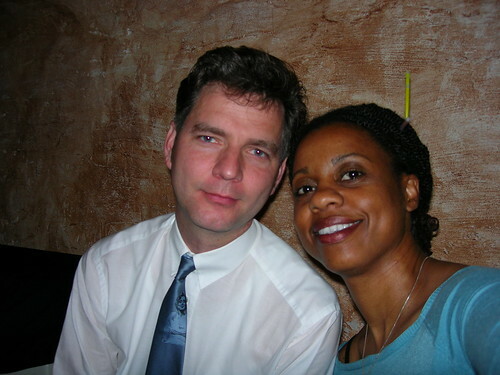 On the day I left, he met me at the train station and took me on a walking/metro tour that was really quite enjoyable. Me at the birthday party. 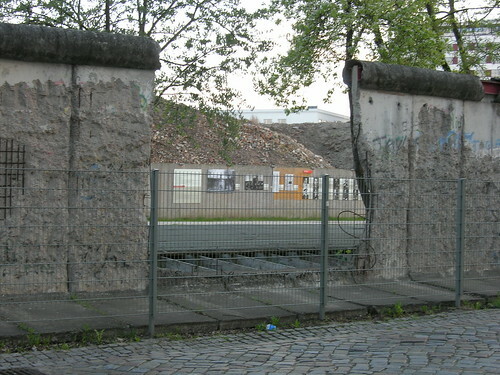 Here it is, folks, THE Berlin Wall! 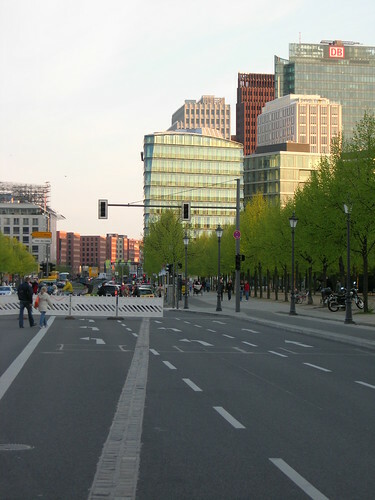 These two pictures are of the first bit of it that I saw, as I was making my way from Potsdamer Platz to the Checkpoint Charlie Museum, and stupid me didn't even realize (for just a few moments) what I was seeing. Then all of a sudden--"Oh my God! Is that the WALL?" Another moment of doubt, and then, "Of course, it must, be, but it looks so....small." Somehow I wasn't expecting any of it to still be standing, even though I KNEW that there was some of it left (as there SHOULD be! It is an important part of world history). 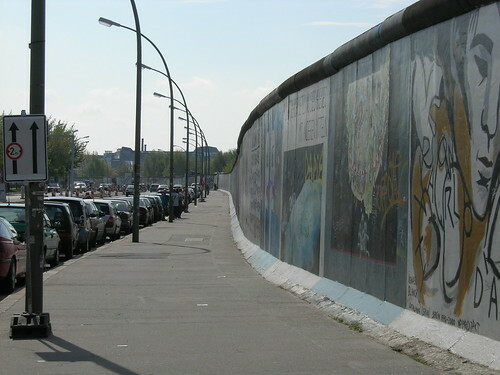 It was incredible to contemplate the significance of this "small" barrier and what it meant to so many people and the history of Berlin. Fascinating. This is where I met Lars before my train departure. 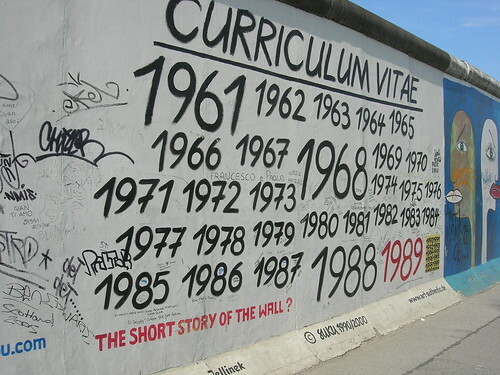 It is the longest part of The Wall still standing, and is also called the Eastside Gallery because of all the artists' paintings on it. A celebration of freedom. 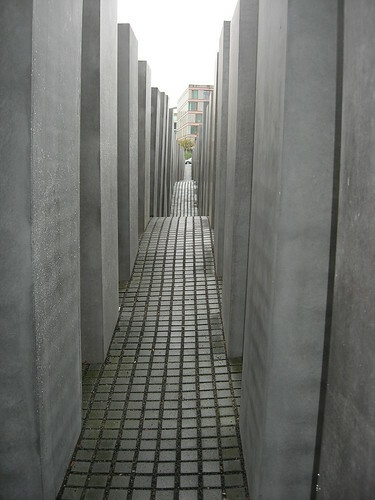 It is so hard to imagine all the people who died trying to get across The Wall--to escape from the East to the West. It is hard to imagine that they kept trying after so many had died before them. It's really a testament to the human spirit and its BASIC need for freedom. 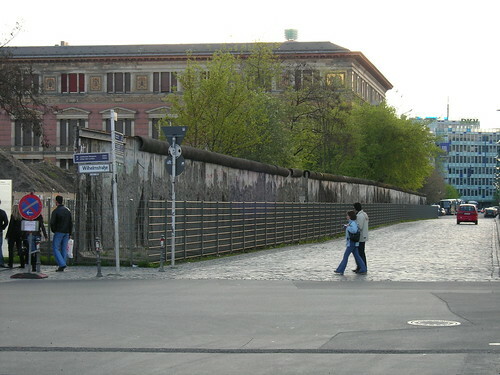 Wall-line to Brandenburg Gate--the bricks in the road represent the place where The Wall used to stand. Just the day before I was riding in a car on this street with Uwe, wondering how on earth I would get this picture. I was imagining risking life and limb to get out in the middle of the street, but as luck would have it, I went back and--not only was it NOT raining--but the street was closed down in preparation for some celebration or demonstration. Much better than going out in the middle of traffic! 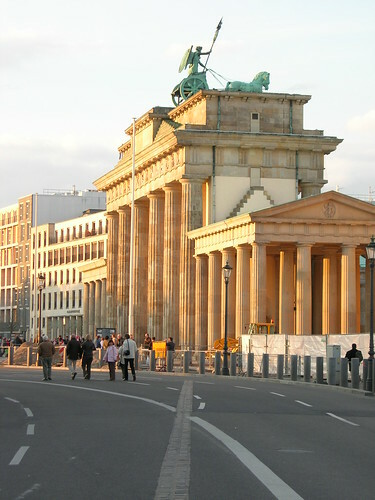 Brandenburg Gate again. And how many times have many of us seen pictures of the gate?? Even when the wall was still standing. 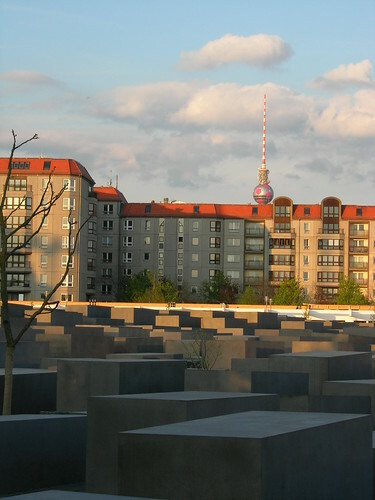 I really found the landmarks of Berlin-- and the city itself, incredibly fascinating. 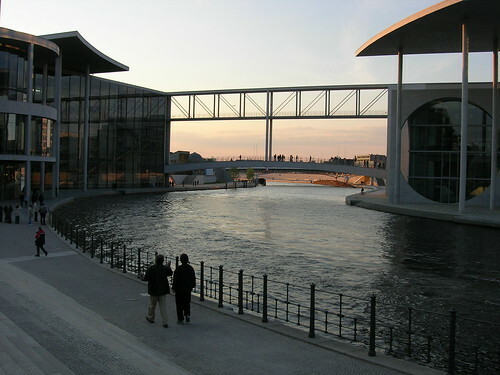 Some say Berlin is not so interesting because so much of it was destroyed in WWII, but I say NO WAY! 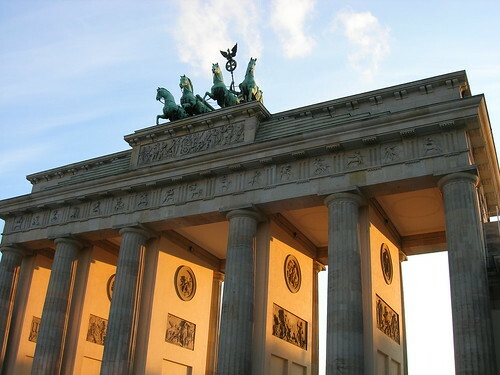 You don't need old buildings (and Berlin does have SOME) to feel the history of a place. 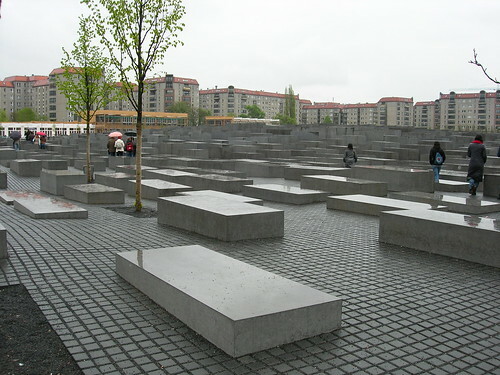 And part of what is so fascinating about Berlin is its response to its history, the way it grows and changes--and continues to do so. It's ALIVE! I loved it. Anyway, HISTORY can also be reflected and respected by new things. Here is an example of a fairly recent addition to the city which does just that. 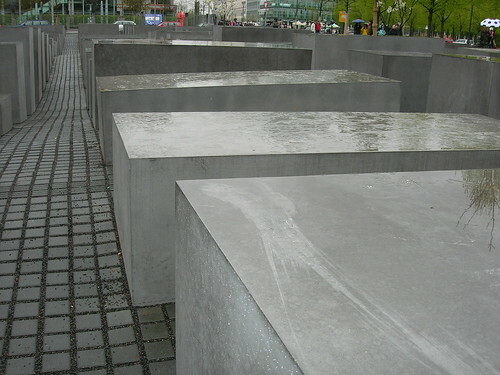 Holocaust Memorial--At first I thought, "Is this it??" but then i really got into it. I found it visually stimulating (as you can see by all the pictures I took) and (though I know little about art) somehow appropriate to its purpose. 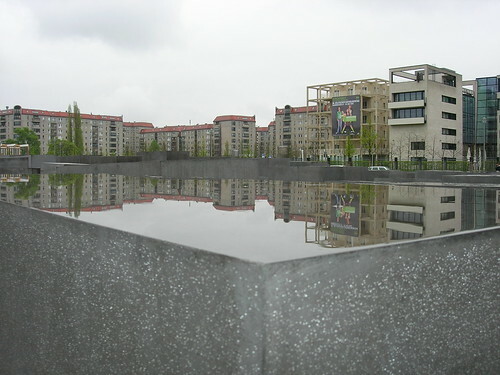 It is a monument to all the European Jews killed in the Holocaust. You will notice that the structures are not all uniform. 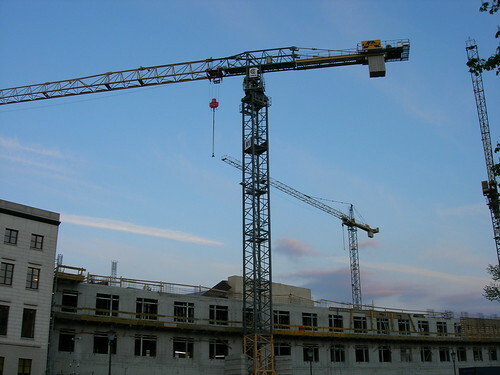 Some are small some are very tall, and they are built at differing angles, both at the sides and the tops. I thought that it said: although these people had a similar fate, although they were all thrown together and treated as ONE, they were all different; they were individuals; they had their own unique qualities and characteristics in themselves and their lives, and these mustn't be lost in/by the common and routine way in which they were destroyed. Well...that is what it said to me. The artist could have had a different idea, but I didn't go inside the museum to read about it. One of my ABsolute favorite pictures I have taken. Period. 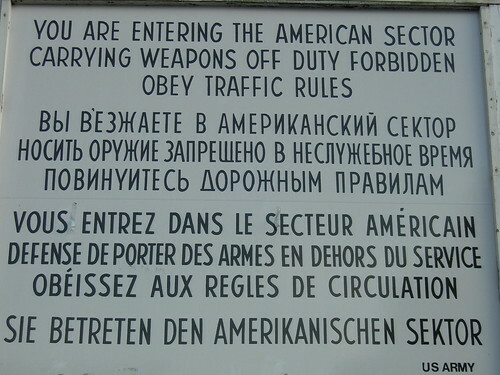 Checkpoint Charlie--The crossing point between The East and the US sector of West Berlin. 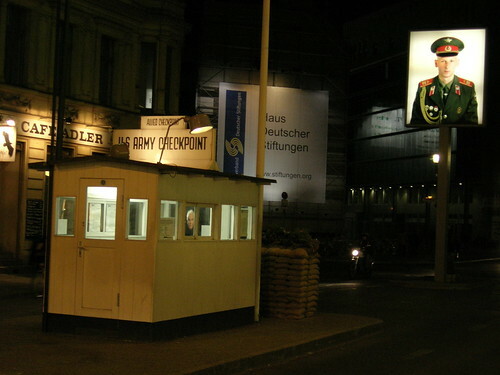 I actually went inside the museum here--The Checkpoint Charlie Museum. Admittedly, it was just a walk-through--not a lot of reading, and I couldn't even bear to listen to too much of the audio-guide (I haven't changed that much!!=)). 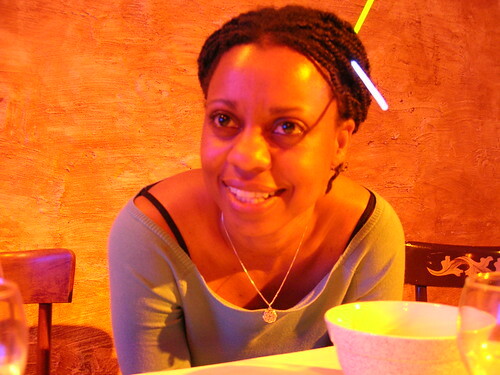 There was just sooooo much information there (visual, verbal, recorded...), that I found it overwhelming. I just couldn't take it--especially so late in the day. I had to just walk and look. Again, I was impressed by the people who risked their lives to make it beyond this gate. Many people succeeded (and I guess THAT is why so many people kept trying despite all of those who had failed). Inside the museum, there are cars and luggage and other things (probably re-created) in which people had built secret compartments to hide in, so that they could cross the border and escape from Communism. It is wild! I would like to go back there (when I am well-rested) and look more closely at the materials...One thing I did like was the model of The WALL, and how they kept making it thicker and harder to cross. I didn't take a picture though. I was unsure of when it was OK, and I probably wasn't even supposed to take THIS one! 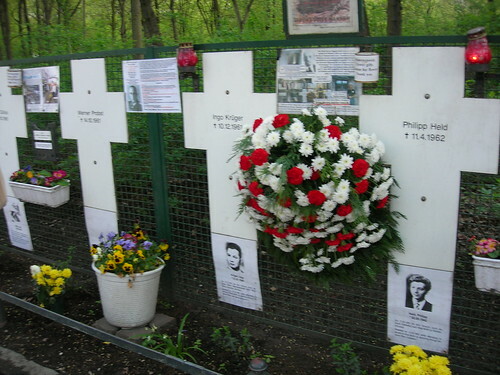 Closer to the center of town are many of these crosses, put up to remember some of the people who were killed while trying to escape to the West. Most of them were shot by the Eastern Guards (some drowned in the river--some of those, after being shot by Eastern Guards). 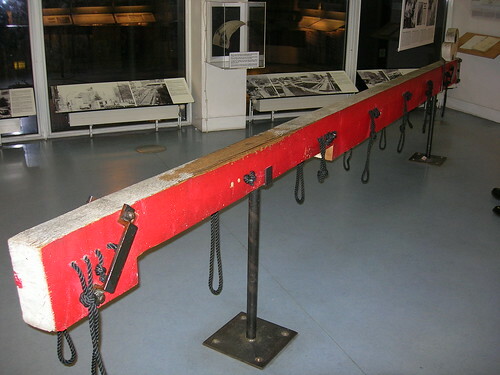 Inside the Checkpoint Charlie Museum, there is a display which tells people to smile at the guards, and remember that they were human too: They didn't always shoot to kill. If they had, there would have been at least ten times more people who died trying to cross over into West Berlin. Hmmm..that's something to think about. 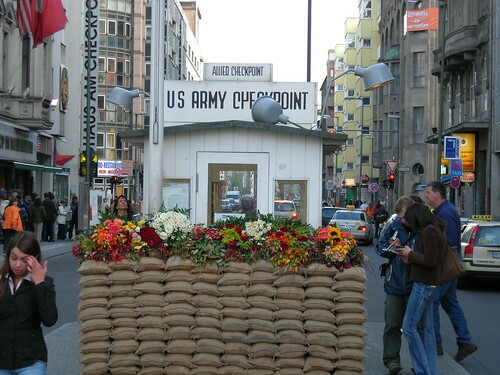 The funny thing about Checkpoint Charlie and all that, is that I didn't think I would be that interested in it, but it turned out to be a lot more meaningful to me than I had imagined. Ampelmann--These are the coolest things! 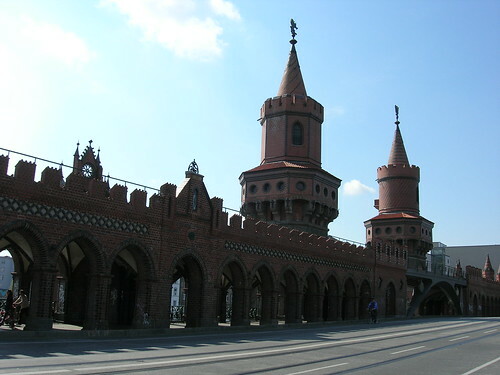 I am told that after Berlin (all of Germany, I guess=)) reunified, most all things "EASTERN" were being removed and replaced, and the people put up with it--except when it came to the pedestrian crossing lights. That's when they put their foot down and said, "Hey! Wait a minute!" They liked their crossing lights, and they wanted to keep them. Not everything form the East needed to go, they said. 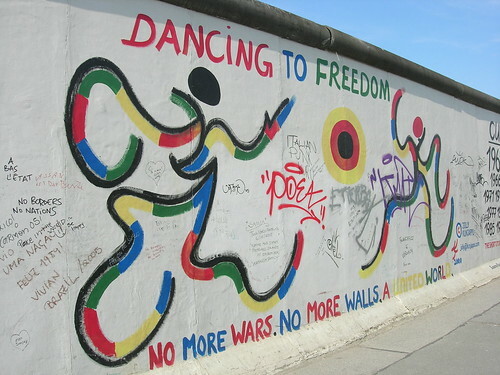 And, I (along with many tourists, and even West Berliners) am glad they did. They really are special. Now there are stores devoted to the sale of Ampelmann merchandise. That's the West for you. But I have to admit, I bought something!!!! Cranes--I had to take a picture of these. One cannot talk about Berlin without mentioning the enormous amount of construction going on there. Everywhere building, changing, improving (?). Yes! It really is EVERYWHERE. I am told (and I can't imagine) that it was far far more of a construction zone about 10 years ago. It's exciting though. I think I could come back here in a year--or a month--and it will be a very different place. 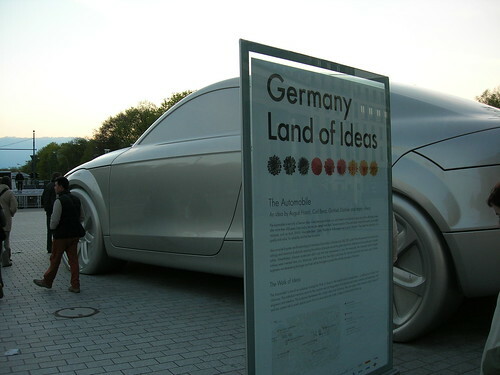 The Berliners are gaining a reputation for self-re-invention. 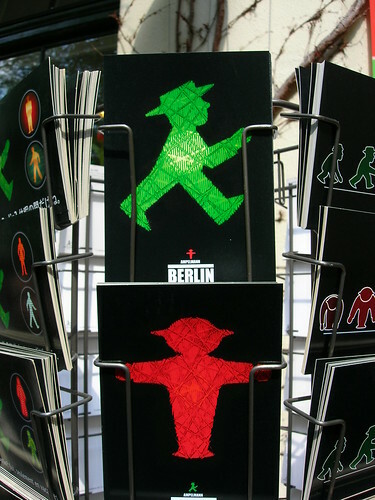 Even the guide books say Berlin is different every hour. It is NOT just the construction they are talking about. It's the vibe, the attitude. It is intentional; the people make it happen. 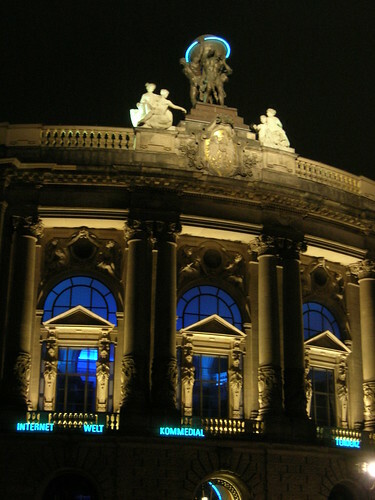 A place has a different feel by day than by night; the activities change. It is definitely a "happening" town. It is in motion. 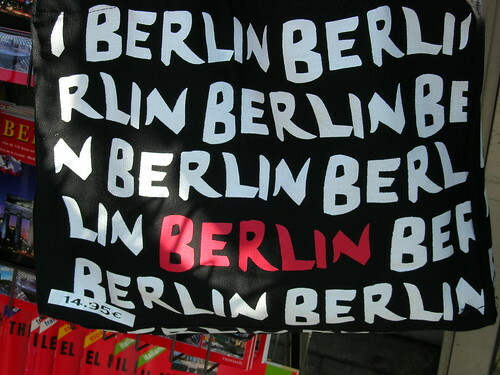 And that makes Berlin an exciting place to live--and to visit. Old Church--not as old as it seems, but it survived the WAR. There are things that are more than 50 years old here, you see? AND the NEW stuff--It ain't so bad!!! 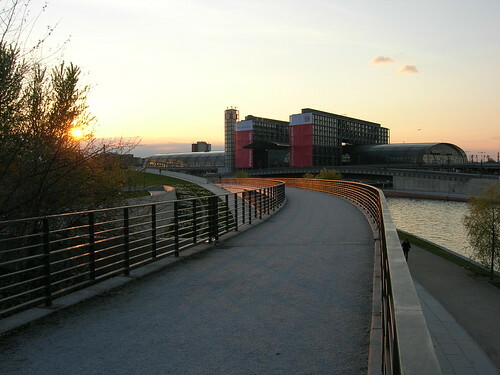 I find the modern structures quite beautiful, really. Clean, open, light, airy. The roads were wide and freeing. I really felt I could breathe here. I will be back!! Where are the other pics and do you ever stay home??? I'm with Carye, where the heck are the other photos? I'm currious to see what you actually snapped photos of and to find out why your Uncle Tuck wants to take me there, hmmm! I bet there are some really interesting and old buildings there, huh? OK, Carye and Mom! Are you satisfied????? And to answer your question, Carye, no, I don't stay home. Not anymore, not on the weekends. 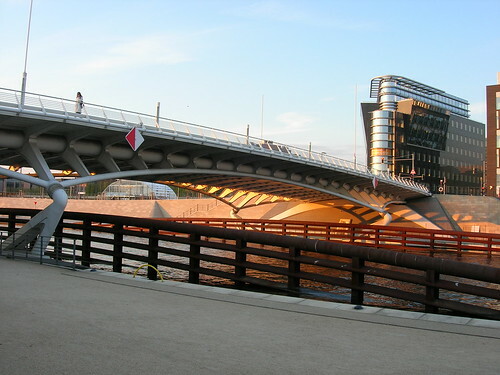 I have one weekend where I plan to stay here to do somethings with Jiri's parents, but that is about it. Places to go! 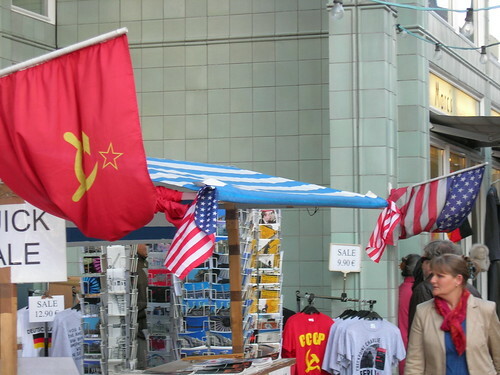 Hello, you don't know me, I just came across your pic's from Checkpoint Charlie Wonderful Pictures and really like how you explained everything!! Thank You for Sharing!! Have a Great Weekend, and Safe Travels!